Do you need a reliable mobile Locksmith to service your commercial properties? Bart’s lock and Safe Service in San Jose, CA can provide Master Key Systems Repair or replace hardware, such as Door Closer, Panic Bar, ADA, Office Furniture Locks & Keys, Mailbox Locks & Keys and more. Contrary to popular belief Master Keying doesn’t increase the security of a lock. Master Keying is a balance between convenience and security. If more security is needed than from a standard cylinder, High Security cylinders can be installed to achieve the desired level of High Security. Bart’s Lock and Safe Service can design a simple Master Key System for a residence or a multi-level system for a commercial building. An example residential system would be if the cleaning or construction crew needs access to perform their work. The door knob for the service entrance can be Master Keyed to operate with two keys a master Key for the owner that will operate all the locks and what’s called a Change Key for the service people to use. The change key will only operate the door knob for the service entrance door. The owner can unlock the deadbolt for scheduled service people and lock the dead bolt at night and during the day to prevent entry by unscheduled service people from entering. If the change key is lost or not returned by a service person only the door knob needs to be rekeyed to restore security. This example will eliminate the need to have a Mobile Locksmith in San Jose rekey the entire house if a key is lost or not returned by a service person. Master Key records are maintained both in paper and digital form and kept locked in a safe to provide the security our customers demand. If a customer needs additional keys the key label can be used to order additional keys. 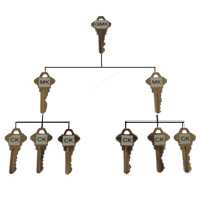 A key can be cut by code using the Master Key records and then duplicated to fill the order. Keys can be shipped to your location saving you time and money. Only people authorized can order additional Keys. There are many manufacturers making Commercial Hardware available for use in Commercial applications. Bart’s Lock and Safe Service in San Jose, CA. can come to your facility with our mobile Locksmith service van to repair, replace or service the following Hardware manufacturers. Schlage, Von Duprin, Jackson, Adams Rite, LCN, Norton, Alarm Lock, Dorma, Falcon and many more… The Van is stocked with the most common repair parts. Give us a call for a free estimate. Bart’s Lock offers a wide range of commercial door closers and assemblies that comply with the (ADA) Americans with Disabilities Act. We only use products from the major manufacturers i.e. Norton, LCN, Jackson, Dorma and more. These products can be used with hollow metal, aluminum and wood doors. 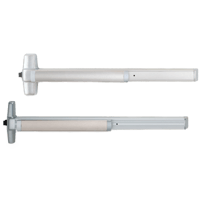 The top-grade door closers are designed to be used on commercial facilities i.e. schools, banks, office buildings, restaurants etc. Bart’s Mobile Locksmith Service in San Jose, CA can service, repair or replace the door closers and doors at your facility. Give Bart’s Lock a call for a quotation. Panic Bars, also known as an exit device (or fire exit hardware when used on fire doors), will allow the occupants of a building to safely exit in an emergency. Bart’s lock and Safe Service can install, repair, service or replace the exit devices on your commercial properties. We service most manufacturers such as Von Duprin, Dorma, Jackson, Adams Rite, Precision, Detex and more. Bart’s Lock mobile service van in San Jose will come to your business to provide professional Locksmith service. Call Bart’s for an Estimate. 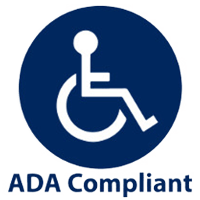 The Americans with Disabilities Act (ADA) was signed into law on July 26, 1990, by President George H.W. Bush. www.ada.gov This ACT prohibits discrimination and guarantees that people with disabilities have the same opportunities as everyone else to participate in the mainstream of American life. 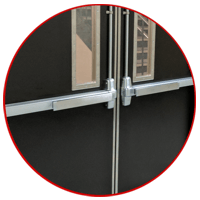 Bart’s Lock and Safe Service can provide and install ADA compliant hardware for your business so it complies with the ACT. The opening force on entrance doors with “door closers” needs to be checked on a regular basis, Bart’s Lock Mobile Service can come to your business to be sure the doors and other hardware is in compliance with the ADA requirements.